Love may conquer all, but it can't do it without putting in a good fight first. 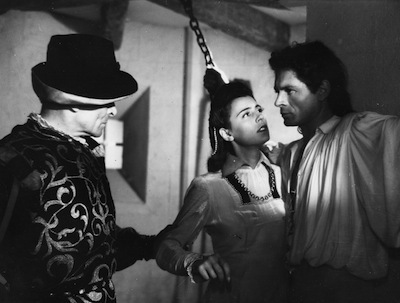 Or so we may glean from Marcel Carné's 1942 romantic fantasy Les visiteurs du soir (The Devil's Envoys). In this medieval tale, two minstrels arrive at a castle in the midst of festivities for an oncoming marriage. 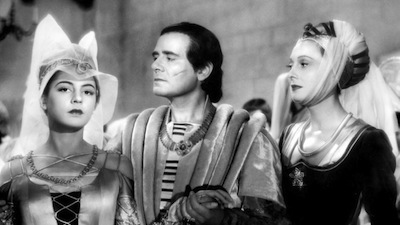 The Baron Hugues (Fernand Ledoux, La bête humaine [review]) is joining his daughter Anne (Marie Déa, Orpheus [review]) with the noble Lord Renaud (Marcel Herrand, Fanfan la Tulipe [review]). She is a young romantic, he is a slightly older pragmatist. Presumably their union is advantageous in some other way, as they don't really love one another. Renaud doesn't believe in such things. The banquet has been wearing on for several days, and while not starved for food, the attendees are starved for entertainment, and their demands are turning toward cruelty. As the riders approach, they are met with a man who lost his pet, a bear that was shot by the partygoers for sport. Inside the castle, the guests laugh at three deformed little people brought in for their amusement. Only Anne has enough shame to turn away. The songs of the minstrels please her, they sing soft ballads about longing and love. Renaud doesn't care for them. As it turns out, the minstrels are no ordinary players. We have already seen them perform special tricks: the male singer resurrected the distraught man's bear, while his companion questioned his off-model compulsion to do good. Dominique (Arletty, Children of Paradise) and Gilles (Alain Cuny, The Milky Way [review]) are former lovers who made an undisclosed deal with the devil. He now owns their souls, and they travel looking for more of their kind for him to possess. Their mission is to find situations such as this and throw a spanner in the works. Gilles seduces Anne with his songs of fidelity, whereas Dominique catches Renaud's eye by being that which he can't have. Both of Satan's minions turn things on their head by switching the roles around and upending emotions. Renaud becomes a romantic, while Gilles grows cruel with Anne. The unsuspecting mortals betray their own best interests for that which they don't really want. To further gum things up, Dominique also offers herself to the Baron, who is longing for his dead wife. Pretty soon, the father-in-law and groom will be squaring off for the right to love the same woman. Les visiteurs du soir is a carefully rendered morality play in which privileged individuals who are amused by the misery of the less fortunate have the tables turned and become the playthings of a power greater than their own. At first, the seduction is quiet and almost idyllic, like one of the forlorn songs Gilles performs throughout. He in particular is quite the dullard, brooding over a love he cannot have. Anne inspires the kindness that lies dormant in her suitor to resurface, and he legitimately falls for her. This goes against protocol, and so the boss man has to come to fix what the boy did wrong. The arrival of the devil at the castle kicks Les visiteurs du soir into a whole other gear. This Beelzebub is played as a devious imp by Jules Berry (Le jour se lève [review]). Presenting himself as a nobleman lost in a storm, he pushes his way into the party, poking at the weaknesses his envoys have discovered and then exposing them to the rest of group. He arranges for Anne to be caught with Gilles, and then manipulates the Baron and Renaud into a duel. Carné has fun with this supernatural character, who can appear in different places at once and otherwise bend space and time to his will. Berry makes for an excellent jester. He is agile both physically and verbally, and his permanent smirk gives his wicked deeds a pleasurable edge. At the same time, the director and his writers, Jacques Prévert and Pierre Laroche, also humanize him. The unshakeable love that Anne has for Gilles proves too much for the devil, and his need to break and possess her reveals that, at least in this narrative, evil is caused by the absence of something. The devil is the creature that he is for the lack of anyone to love him. 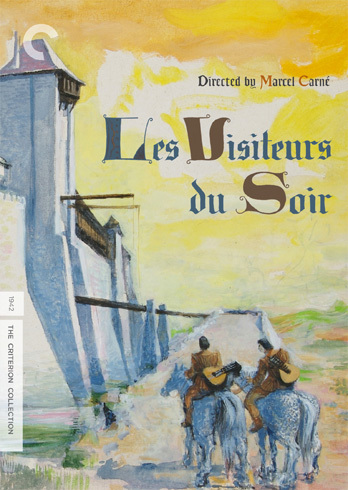 Given the time period and the conditions under which Carné made Les visiteurs du soir (some of which is covered in the documentary that appears as a supplement on the disc), some added meaning could be read into the film. The Nazis occupied France, and filmmakers were urged to join the collaboration and make pictures that promoted the "go along to get along" cause. 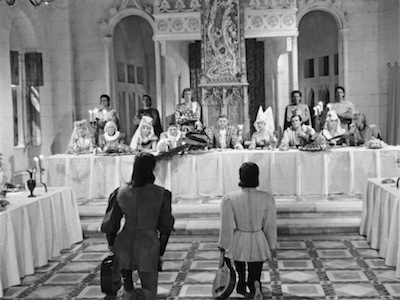 Carné and his crew made their movie independent of Goebbels' propaganda machine, seemingly choosing a medieval fantasy tale to avoid any modern correlation. Yet, it's possible to see Les visiteurs du soir as veiled commentary on the perils of the Vichy government. If the Baron had been more wary of outsiders, had he and his daughter and her fiancée not been so quick to please these people that held sway over them, disaster might have been avoided. Only Anne manages to come through with her principles. The tyrant is powerless when confronted with her purity. Her ideal for living and loving is stronger than his, and in the end, he is a petty fool. As interesting as this history is, it's also immaterial to one's enjoyment of Les visiteurs du soir. Any well-made art is both of its time and separate from it. It's quite easy to enjoy the movie for what is on the surface. Carné's concoctions still delight. His playful special effects, both simplistic and clever, still create a sense of magic. In my favorite sequence, Dominique strums her mandolin and stops time. Then she and Gilles pluck their targets from the frozen scene and lead them into the garden, where lovers enjoy one another amidst the topiary. Arletty is particularly alluring here. Her mysterious eyes and reserved manner invite the viewer to want to know more, which is the exact opposite effect to Cuny's brawny mope. His sad wailing in his prison cell is almost comical to behold. 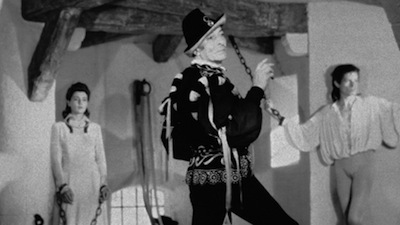 Making Cuny a hunky leading man is the one illusion Marcel Carné can't pull off in a movie that is full of wonderful creations. The castle, the costumes, the odd creatures in the shadows--the director achieves his cinemagic by being meticulous in his detail, but also by treating it as if it were normal. There is nothing overdone about Les visiteurs du soir. The movie has been built with the same uncluttered clarity as we see in art director Alexandre Trauner's unassuming paintings, which Criterion have used to decorate their Blu-Ray package. (I quite like that the inside of the case is the inside of the castle.) The direction is as unfussy as the movie's message: it's all about purity, about staying true and staying the course. It's the simplest seduction of all, no devilish tricks required. Special note should be made of the gorgeous high-definition transfer on the Les visiteurs du soir BD. The film has been restored lovingly, so that the black-and-white image looks sharp and shows very little blemish. It makes me all the more eager to check out the other new Marcel Carné disc, the re-release of Children of Paradise. The roadshow version of the new print is said to be stupendous, and I can't imagine any less from Criterion's HD treatment of the same.